Cougar Marching Band director Fred K. McInnis leads a pre-halftime rehearsal in the band’s new digs—the 4,170-square-foot Cougar Marching Band Hall. 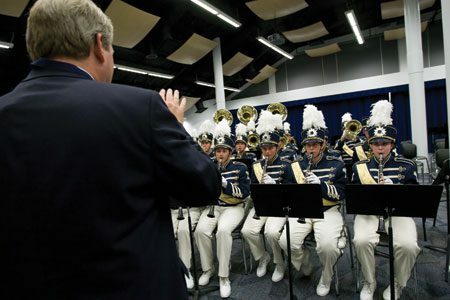 The donor-funded facility opened in fall 2008, just in time for the band’s 100th anniversary. Located under the west bleachers in LaVell Edwards Stadium, the high-tech hall gives the band a place to practice when inclement weather strikes, as well as a place to review halftime tape and marching patterns. Another added benefit: the band no longer carts equipment around in car trunks; there are 265 storage cages in the hall—a veritable Cougar instrument kennel.